The Rock Adapted Joystick features functionality of a traditional mouse in a joystick that requires minimal hand movement. 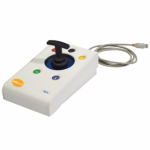 Includes 3 interchangeable joystick handles - a straight stem, a T-bar, and large soft ball. PC and MAC compatible. · 3 interchangeable handles (straight stem, T-bar & large soft ball).